Professional Website Design is essential for every business. At DientWeb, we build CMS driven, mobile responsive and functional Professional Websites. Our websites are always equipped with security measures against hacks. Also, we optimize websites for fast load time. Search Engine optimization is a great part of our Professional Website design services. Therefore, we don’t close a project until a good search presence is achieved. From single-page website to multi-page website designs, you can count on our expertise. Over the years, we have built many awesome websites for clients here and abroad. Contact us, we are always available to work with you any time. Our web design strategy is designed to help businesses succeed more in this digital age. Hence, you will be glad to have worked with us on your website design project. Get a well crafted website for your school, organization, company or event. Providing prospects with an easy to use web platform where they can access information about your services is a great thing you should do. Sell your products and or services online with ease. eCommerce is the new-school way to sell faster at no additional cost on rent and workforce. You can simply go to sleep while your website does the work of selling your goods for you. And when your website is ready or the plan for the event is set, the next thing is to make the right people know about it! That is where Digital Marketing comes in. Your potential customers/clients are online, let’s reach out to them. 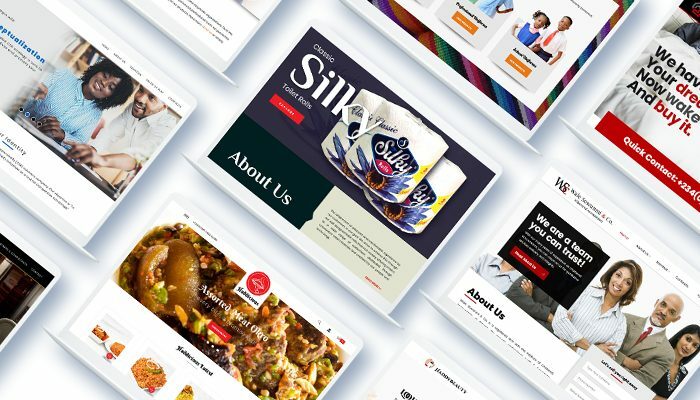 DientWeb has some of the best Web Designers in Lagos Nigeria. Websites built by our website designers always come with essential features. These features include website Security, SEO, Blog, Newsletter and CMS. You can contact us to request a meeting with our web designers. Also, you can fill our quote request form or send us an RFP via email.